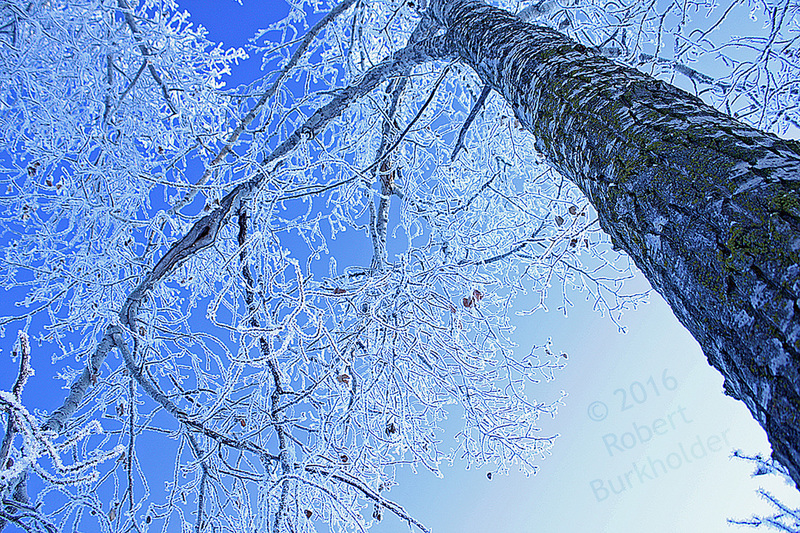 Members and guests of the club were captivated by the presentation by Robert Burkholder in the February Member’s Showcase, and the group responded with enthusiasm to both the digital presentation and the printed images which were on display. Like many of our club members, Robert’s early interest in photography started in the days of shooting black and white film, which he then developed and printed in his own “bathroom darkroom.” This was followed by many decades of only occasionally picking up his camera. It was not until his retirement that he was able to re-engage with the interest in photography. Initially reluctant to convert to a digital camera, Robert soon learned to embrace the freedom and power of digital post-processing. Robert claims to be mostly a landscape photographer, with a preference to tight, intimate compositions over broad vistas. He recognizes that he is not ‘purist.’ He sees the image captured by the camera as a starting point in the creative process, much as a pencil sketch is often the starting point of an oil painting. Sometimes before he even captures an image, Robert knows what he would like to see as the final result. At other times, the final result appears to him through the evolution of post-processing. Robert’s presentation, Some Roads Taken, featured a collection of images taken over his travels combined with images captured closer to home. Additional print images were also on display for members to enjoy throughout the evening. The digital presentation consisted of four sections: On the Road, Water Ways, Winter Trails, and After Dark. ​Included below are a collection of comments Robert made about a selection of the images he shared that evening. ​“In March Peter Carroll spoke about the stories images can tell. Like Peter, I think my images are better when they tell a story, and I selected images for the February Showcase with that in mind. Of course, the range of stories that can be told by an image is enormous. 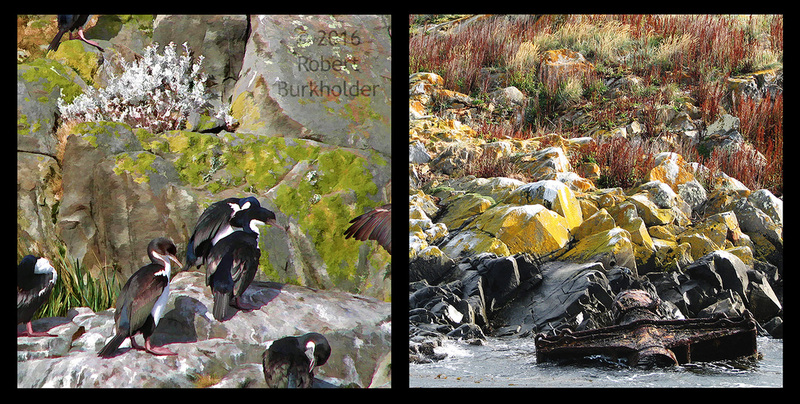 The images for the diptych pictured here were captured a few metres from each other on the Beagle Channel at the bottom of South America. For me, they bring back memories of a cloudy, showery day a long way from home. For most viewers the images include a story of tones. The inclement weather produced muted tones, which I muted further for the image on the left (with the Cormorants) by using a Simplify filter. Did you see the four partial birds, one at each of the image edges? Obviously, they violate a basic and important rule of composition but, as Michael Freeman has stated (in his book the Photographer’s Eye), ‘composition is determined by intent; by the story you wish to tell.’ I think the partial birds contribute to the story so I cropped accordingly, composition rule or no. Harvest is a special time on the prairies and I have made many attempts to tell some of that story. The image of the jelly roll hay bales is not a composite but, rather, a single image cropped to a panorama. I did not have a panorama in mind when I released the shutter but, on reviewing the image later, I realized a narrow slice of the image told the whole story. That is what designers call ‘the critical slice.’ I always scan my images for the critical slice looking to remove anything that does not contribute to the story. 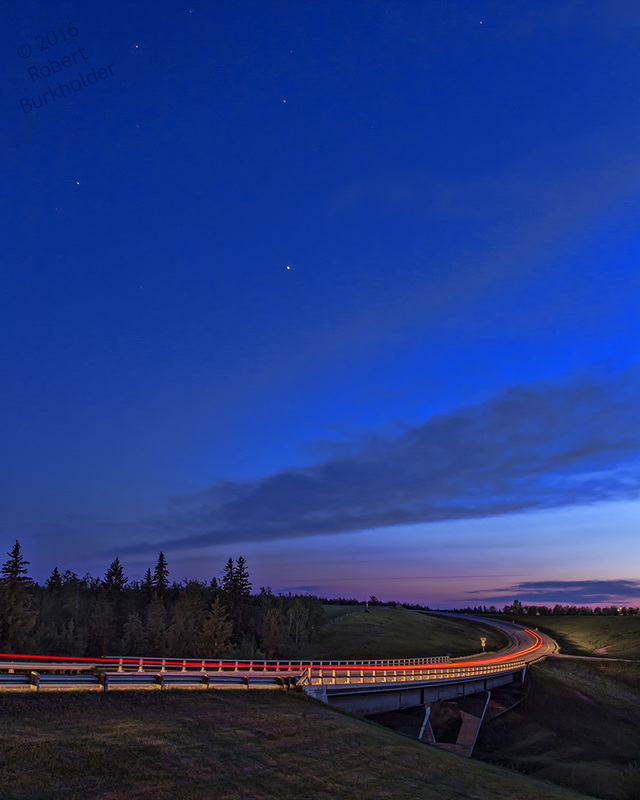 The twilight image of a rural road was captured in Gibbons, north east of Edmonton. For me it tells the story of a quiet, secluded drive home, a familiar experience given I live rurally. The car headlights helpfully provided a good deal of the lighting. The untold story is the surprising number of drivers that saw me with my tripod and camera pointed at the road and assumed I was part of a radar speed trap. Oh, the bribes that were almost mine. © Robert Burkholder "Beagle Channel"
© Robert Burkholder "Jelly Roll Sunset"
© Robert Burkholder "Lonely Road"